We have covered the festival known as Electric Gardens since it first debuted in 2016. What was a success in every aspect and a welcome addition to the festival circuit topped its offerings with its sophomore incarnation last year. The 2018 shindig saw a refined version with four stages, each of which had their own theme and a high caliber of acts that graced them with their presence. As mentioned in our previous coverage, Centennial Park is a thing of beauty and its natural features provide an ideal backdrop for a festival of these proportions – if you consult the dictionary to find our more about the “quintessence of a summer’s day out in Sydney”, you might find a picture of the festival in full swing. This year’s high caliber acts includes Motez, DJ Henry Salz (who took things slow with his accentuated set), a trancey set by Gorgon City and the evening culminating in Fatboy Slim holding court again. I have waxed lyrical about Norman Cook’s qualities as a headliner act before and this year’s set was not a disappointment either. Slowly building up, the set covered all of his trademark bases and was framed with the elaborate visually appealing light and video show that enhanced and complemented the musical aspect not just with animations but also footage from movies. 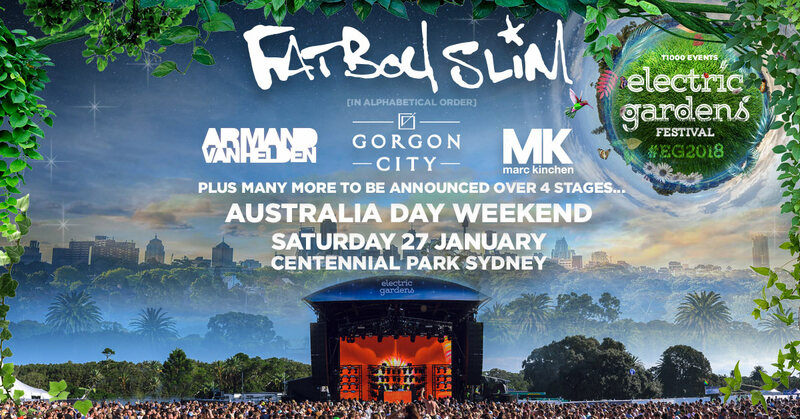 As far as DJ sets go, Fatboy Slim is the gold standard, especially when it comes to catering huge crowds. Mixing tested and tried crowd-pleasers with hints, references and allusions to classic hits, Cook’s delivery was the evidence for why he has never not been considered to be one of the most accomplished and entertaining DJs. As in previous years, the main stages were framed by chillout areas, mini stages with intimate sets, gourmet food trucks and drinks as well as a VIP Garden Party, with a lavishly themed in- and outdoor area for the ones that wanted to glam up their festival experience. Electric Gardens 2018 showed that the festival has found its distinctive voice and style that stands for a premium festival in a near ideal location.